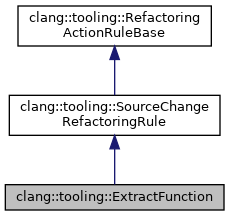 An "Extract Function" refactoring moves code into a new function that's then called from the place where the original code was. Definition at line 20 of file Extract.h. Definition at line 59 of file Extract.cpp. Initiates the extract function refactoring operation. Code The selected set of statements. DeclName The name name of the extract function. If None, "extracted" is used. Definition at line 69 of file Extract.cpp.